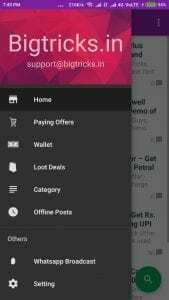 Bigtricks App Loot: Hello Guys We are happy to announce that we have launched Bigtricks App.Now We are Offering Rs.10 On Sign up and Rs.5 On Each Friend, You invite.You can Redeem Referral Earning For Paytm Cash, Mobile Recharge, Amazon Voucher or Flipkart Vouchers.The Offer is valid limited time so Grab maximum Paytm Cash By Inviting Your Friends to install the App. Bonus: There will be a new giveaway every week so take Part and Win Existing Prizes. 2.Now install the App and Provide all the permissions. 3.Now open the App and you can see latest Posts and Deals from here. 4.Click on three Dots and Go to Wallet Option from the menu. 5.Now it will take some time to load Signup with your Correct details. 6.Now verify Your Mobile number by OTP. 7.Once You Complete Registration You will be Redirected to Dashboard from where you can get Your Referral Code and start Sharing with Your Friends. 8.You can redeem Your earnings once You collect Rs.20 By referring Your Friends. 2.Just visit to Rewards from the Refer Friends option. 4.Submit Your Mobile Number and amount.your recharge will be processed instantly. 1. Copy Your Referral Code and link share with your Friends and ask them to Put Your Referral Code and Done. You can Redeem Your Balance for Mobile Recharge, Paytm cash or Amazon Vouchers. You will Get Reward only if Friend Download App From Playstore not By App backup or transferring App. 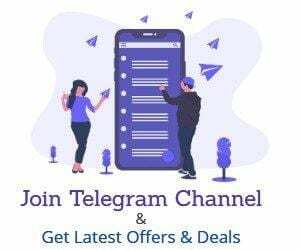 Share About Bigtricks App in Whatsapp or Facebook Groups. 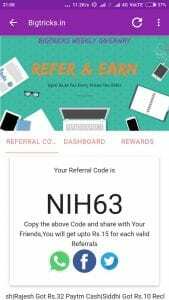 Copy Your Referral link & Referral Code and Share With Your Friends. The Offer is valid For Limited time so hurry and Earn more. Fake Installs or Direct App Transfer will not be Counted as Successful Referral. 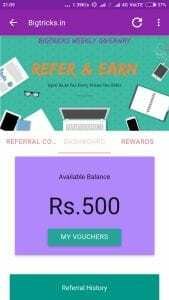 the Referral reward is Rs.5. we have right to terminate Referral offer anytime if Found Misuse of this offer. Is there any chance to earn unlimited paytm cash..???????? Any Unlimited trick ??? ???? There is no option of refer friends..
otp is not coming.. why?? Earn Rs. 5,000 ~ 20,000 per month..
Work at your own spare time and get paid monthly. There is no need of spent lot of time to do this.